As you can see, I sometimes trap rats on the roof. In fact, the most common name for the species rattus rattus is the Roof Rat. They are named this because they spend 90% of their lives up off the ground - in trees, on power lines, and more often than not, because rats live in urban environments with people, they are on the roof. But they don't just hang out on the roof, of course. They are on the roof because they are going into the roof, and into the attic of houses and buildings. In fact, I think that rattus rattus should actually be called the Attic Rat! Regardless, because they so frequently use roof entry points, I sometimes set traps on the roof, as seen in the above photograph. Rats travel the same paths over and over, so I set the roof traps near an entry hole into the attic, and that catches them for sure! First of all, be careful. You're going to be doing some ladder work and climbing. I bolt the traps down using metal screws. When you do this, be cognizant of breaching the roof of the house - you don't want leaks! I seal up any holes I create for trapping. The truth is that you don't actually have to trap on the roof, as shown in the above photo. I prefer to trap inside the attic. 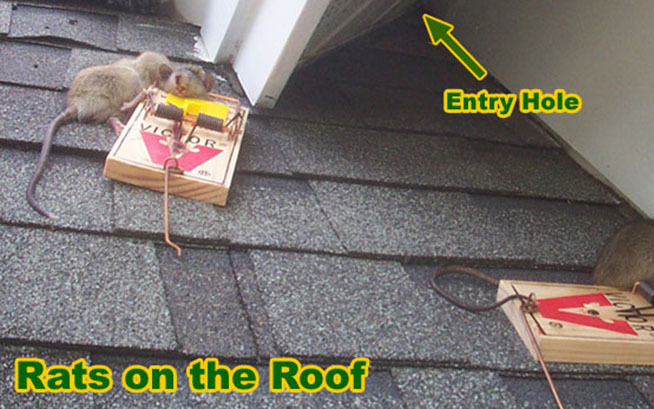 There's no need to set trap on the roof - once the rats are sealed out, why bother? I only did so to prove a point, that rats run on the roof to enter the holes into the attic. The fact that I caught them, easily, proves that they run on the roof. Rats don't really cause any problems on the roof proper. They don't destroy shingles. They poop and pee on the roof, yes, and you can see the evidence under UV light, but this is outside, and doesn't cause any harm that I know of. Even though rats can enter a home at ground level, there are a few species that are adept climbers and will use trees or poles to gain access to a rooftop. The roof of a home is one of the most neglected areas of the structure. Roofs are out of immediate eyesight and any damage may go unnoticed for years. 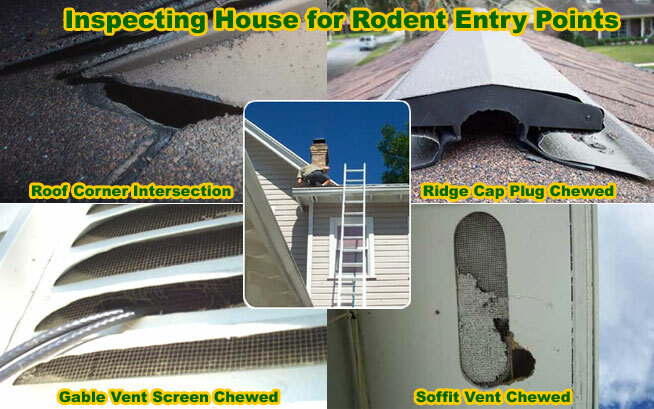 The most common areas for rats to sneak into a roof are at the vent openings and through damaged eaves. Both of these locations will provide instant access to the attic or roof area and a homeowner will only know there is damage if they are actively looking for it. Some homes have gaps around the chimney where rats can slip through. Chimneys have the roof built around them and will have gaps that are usually closed with roof tiles, tar, and skirting sealants. Over time, weather and age will break down these areas and result in gaps. Some rats will even go down the inside of inactive stone chimneys, so make sure caps are placed on all potential entry points in the roof, inactive or not. Keeping your trees cut back won’t necessarily fix your problem, either. Rats that climb trees can scale the side of a home, too. Eliminating the tree will not eliminate the rat’s desire to climb. Although I wrote this site with rats in mind, such as the Roof Rat and Norway Rat, the same principles apply to other rodents, such as the house mouse. Mice behave very similarly to rats, they're just smaller. Email me if you have any questions about how to trap a mouse on the roof, mice on the roof, and problems with rodents on the roof.